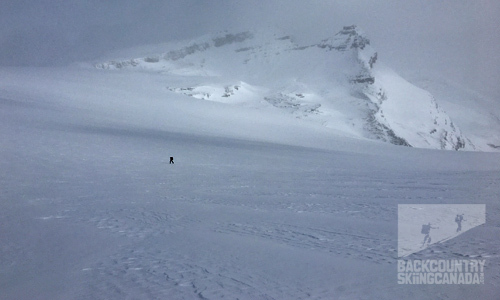 Most backcountry skiers are familiar with the Wapta Traverse, it’s an iconic Canadian ski traverse located in the heart of the Rockies just outside Lake Louise. 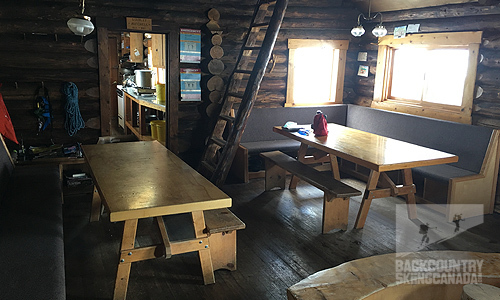 Covering 50km from start to finish, the Wapta Traverse takes 4-6 days and has four Alpine Club of Canada huts spaced approximately 10km apart along the route. 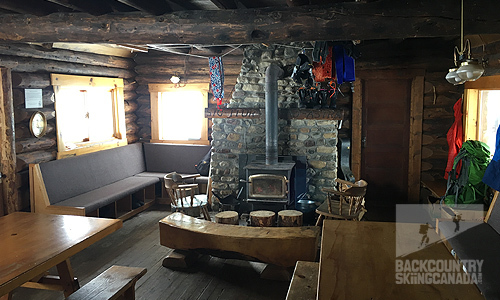 Utilizing the Bow Hut which is part of the Wapta Traverse and with the addition of the new Louise and Richard Guy Hut you can now ski traverse to the Stanley Mitchell Hut without the need to spend a night winter camping along the way. This new Bow Yoho Ski Traverse runs east to west and starts at Bow Lake on Highway 93 and finishes near Field BC on Highway 1, 53km away. The traverse typically takes 4 days to complete with a night spent in each of the Bow, Louise & Richard Guy and Stanley Mitchell huts. 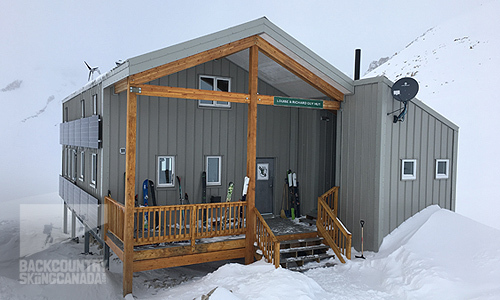 It allows skiers to get into the Presidents Range without having to slog the 22km into the Stanley Mitchell Hut from the Takakkaw Falls access road. The addition of the Louise and Richard Guy Hut was the missing link in this traverse and now opens up the possibility for several other traverses and loops in the area. 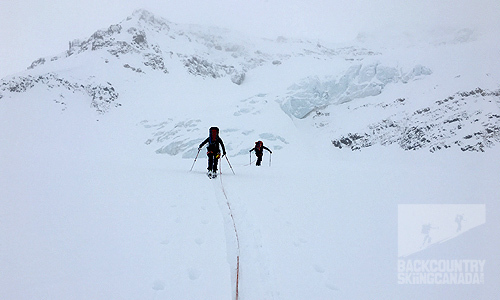 This traverse involves glacier travel, avalanche hazards and possible whiteout conditions so you need to either hire a guide or be proficient in your rope rescue and navigational skills before attempting this route. Wilderness passes are required if you plan on staying in the backcountry overnight as well all vehicles stopping in a National Park must have a Park Motor Vehicle Permit. Annual or single day permits and wilderness passes can be purchased at most Park entrance gates and Park visitor centres. The entire GPS route can be found here on our Garmin Connect page and if you want individual routes for each day then have a look below. 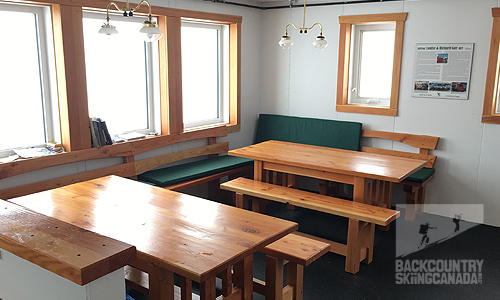 For a full listing of backcountry huts, cabins and lodges (including all of the Wapta Traverse huts) check out the Rocky Mountain lodging page over here. If you are travelling from afar to complete the Bow Yoho Ski Traverse then be sure to book a night at the HI Lake Louise Alpine Centre in Lake Louise for a good meal and a solid night's sleep before and after the traverse. It's a great place to use as a base camp for any ski or climbing objectives along the Icefields Parkway or to simply ski at Lake Louise Ski Resort. The route to Bow Hut starts behind the Num-Ti-Jah Lodge and crosses Bow Lake. The ski across Bow Lake can be long, cold and windy but you eventually get there. Head west to the far side of the lake (west), if you lose visibility then you can handrail the south edge of the lake until you reach the far side. From here you enter a gully which is an obvious terrain trap and should not be considered in high avalanche conditions. Following the gully, you gradually climb out on the south side and contour around a steep slope heading west. When you leave the trees you eventually see the Bow Hut high above on a ridge to the north-west. The route continues heading west towards cliffs in the distance, you lose some elevation before climbing up a steep south face to the hut. The final approach to the hut is short but steep and you should be aware of skiers above you descending. Overall, this is not a big day and a good warm-up for things to come in the coming days on the traverse. See the GPS route here on our Gai GPS page here. For an overview of the Bow Hut and all its amenities click on over to our Lodging Page here and watch the video below. ACCESS: From Highway 93 at the Num-Ti-Jah Lodge, ski across Bow Lake and follow the draw up a gully (terrain trap) until you reach the alpine and contour around to the hut which is situated on a high ridge in view to the North West. Leaving the Bow Hut with St Nicholas Peak off your left shoulder as you head west over the Wapta Icefield you’ll tackle 1,000ft of elevation gain before you get a glimpse of Mount Collie and Mount Des Poilus in the distant background. These will be your bearings as you descend almost three kilometres down the glacier. While this is simple in good weather it can be very difficult in whiteout conditions. 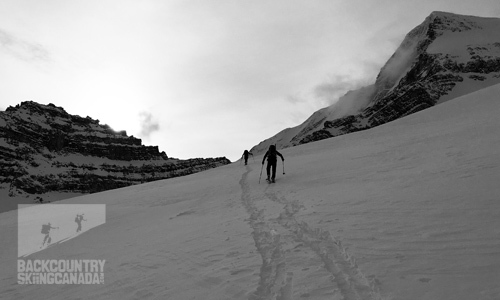 If you haven’t roped up prior to this point you will want to now as you'll have to pick your way around several crevasses, trending right and north to gain the high ground above. Hand railing off the cliffs to the west you will descend 1,300ft before you reach the hut. It is not hard to find the hut if you stay next to the cliff line and on the fat ridge that forms as you ski further down. Ensure you don’t ski past the hut at 2,350m as this is easily done if you are not on the ridge but instead in the open to the east. Look for Yoho Peak and use this as a marker as the Louise and Richard Guy Hut is at the base of its north ridgeline. This approach can be tricky in whiteout conditions so be sure to plan your route well in advance and get all the maps and beta you can. The ridge to the hut is accessed at 2,750m so do not ski below this or you will be going the wrong way and have to backtrack. Many skiers have missed the hut and been involved in an accident which could have been avoided if they were on the correct course to the hut. 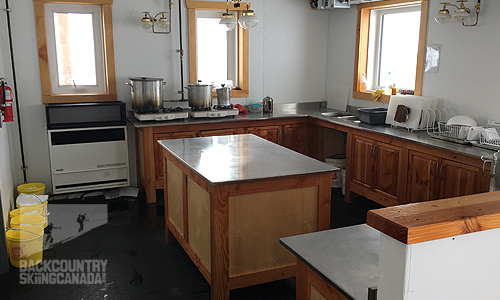 The Louise and Richard Guy Hut is the newest ACC hut an has a small carbon footprint due to its use of solar and wind energy to generate electricity. The hut’s stoves and heating are powered by propane as are most of the lights. This hut is for winter use only from December 1st to April 30th. See the GPS route here on our Gai GPS page. 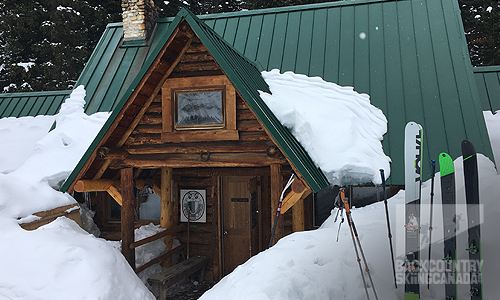 For an overview of the Louise and Richard Guy Hut and all its amenities click on over to our Lodging Page here and watch the video below. 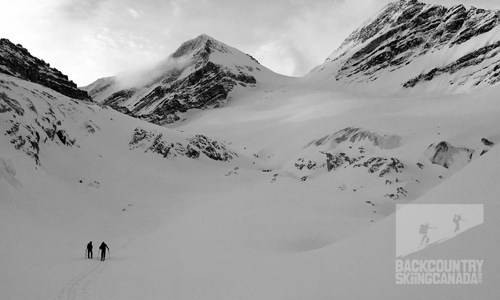 ACCESS: From the Bow Hut you cross the Wapta Icefield heading towards Mount Collie. Leaving the Louise and Richard Guy Hut you’ll follow the ridge briefly until it starts to drop away to the west. 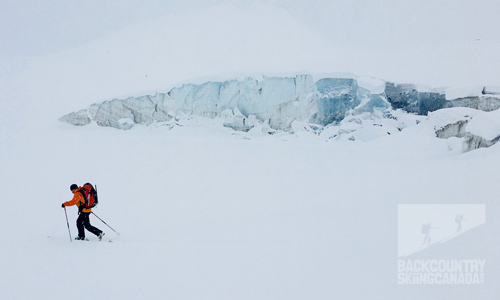 After a short descent, you can rope up and cross the Des Poilus Glacier (as it is crevassed) or contour around it to the west. Heading south you’ll climb up and over a moraine and be at the base of the biggest climb of this route up to Isolated Col. which is just shy of 1,000ft and the crux of this route. 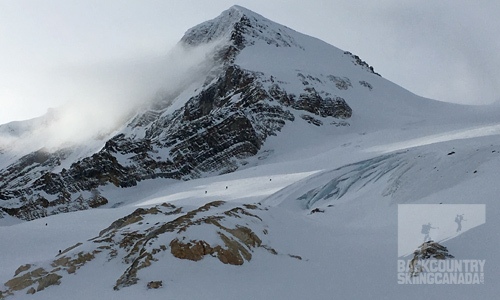 In low avalanche danger the climb is relatively straight forward but in times of high danger it is prudent to ski tour around to the east and down to valley bottom, then climb back up to the Stanley Mitchell Hut via the summer hiking trail which is also the exit route from the hut. If conditions permit climb to Isolated Col., from here there is a steep descent that again requires good avalanche safety skills and conservative route finding. 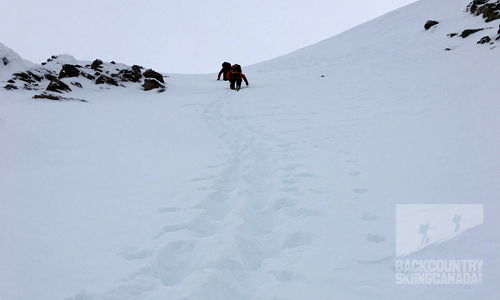 After the initial steep descent, you'll cross several more avalanche slopes so be cautious and methodical in your approach. Continue descending down to tree line then pick your way through the trees heading east until you find the cabin which lay in a large clearing with a front row seats to the spectacle that is the President's Range. 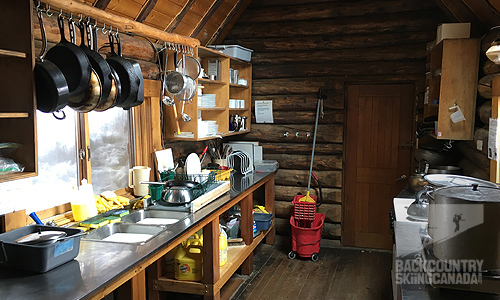 When you arrive at the Stanley Mitchell Hut you’ll find a cozy log cabin with plenty of ambience and history—a sharp contrast to the previous nights lodging. 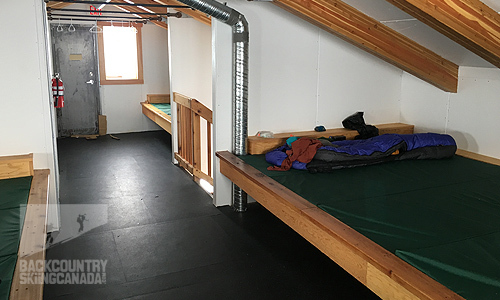 Inside the hut, there is the main room, kitchen, private bunk room and an attic loft which provide the bulk of the sleeping quarters. In the main room, there’s a wood stove that keeps things warm and is typically the gathering place for conversations. The kitchen just off the main room is well stocked but can become busy at mealtime. 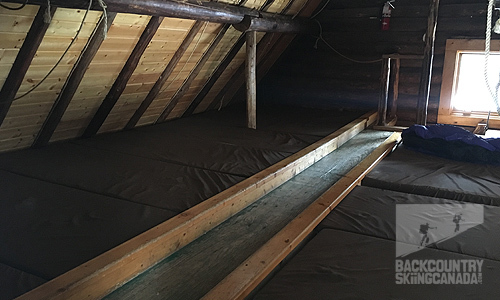 The loft upstairs can get very warm so be sure to make use of the sliding door to keep the warm air downstairs. See the GPS route here on our Gai GPS page and if you want to climb the Vice President then that GPS route can be found here. 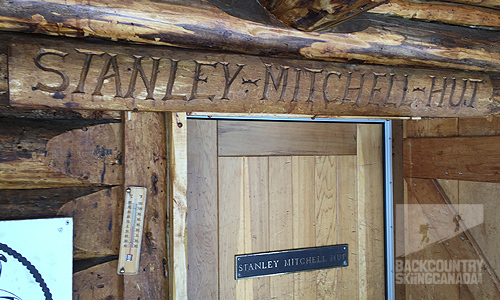 For an overview of the Stanley Mitchell Hut and all its amenities click on over to our Lodging Page here and watch the video below. 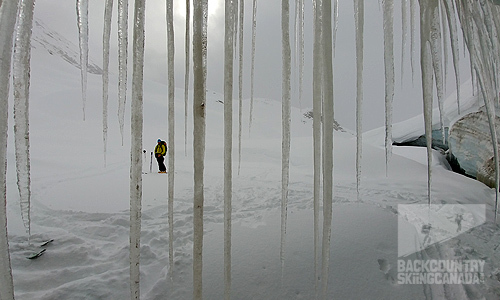 ACCESS: From the Louise and Richard Guy Hut you cross the Des Poilus Glacier and climb Isolated Col descending down to the Stanley Mitchell Hut. LAT/LONG COORDINATES: 51° 31' 33" / -116° 33' 50"
The ski out from the Stanley Mitchell Hut has to be the low point on this traverse. Not only do you quickly lose the alpine views but it is a long slog back to the highway with most of it being dead flat so cross country style skiing is required. Heading east from the hut you gradually lose elevation on a roller coaster trail through the woods. Be cautious here as injuries are quick to happen if you get up too much speed and are surprised by a tree, sharp corner or both. The trail can often be icy which is another reason to descend cautiously. Once the trail levels out you will find yourself at valley bottom, you’ll turn right (south) and continue following the now relatively flat trail until you reach the parking lot and access road for Takakkaw Falls. Here you have to decide if it is more efficient to skate ski or put your skins back on. There are a few modest descents along the way which are more efficient without skins on, but there is a lot of flat ground to cover in between these. At one point you’ll encounter a steep slope which has a few switchbacks in the road, here you will want to de-skin if you chose to use skins up to this point. The descent warrants skiing down as it is long and you can cover ground much quicker without skins. The remaining kilometres after this are flat and you’ll eventually concede and want to have your skins back on your skis to the finish. With your head down and determination, you should be able to cover the distance to the highway in just under four hours if all goes well. See the GPS route here on our Gai GPS page. ACCESS: Leave the Stanley Mitchell Hut heading east following the summer trail down to the valley bottom where you will turn right and head south until you reach the parking lot and access road for Takakkaw Falls, follow this to the highway.